Jura Impressa C60 is a super automatic espresso machine – from grinding your coffee beans to brewing your perfect cap with just a touch of a button. So, what could be better than a coffee machine that does everything for you? What about one that comes with a more affordable price tag? When we decide to do reviews of automatic coffee machines from some of the top brands, we knew that Jura was on that list. Jura opened in 1931 and now has a strong reputation around the world for its impressive line of fully automatic coffee machines. Once you fill the reservoirs with water, milk and coffee beans, your machine can grind the beans, heat the milk and water, brew coffee and pour everything in your mug. 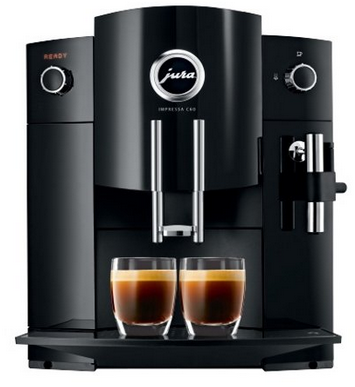 One of the highest rated models we saw was the Jura Impressa C60 Automatic Coffee Center (View on Amazon.com). With this coffee center in your kitchen, you’ll never again need to buy from a barista. With its low price tag, the Impressa C60 even pays for itself within a few years or less. The Jura impressa C60 has an impressive warranty – it comes with a two-year warranty by Jura! Its froth milk setting lets you froth milk and add it to any coffee drink. You turn the steam knob and press the button that has a steam image on the front. As you twist that knob, you can get more or less foam. Do you like changing up the strength of your coffee based on different factors? With the C60, you can easily make a stronger cup early in the day and then make weaker cups later. This option is also great for homes and groups that share one machine. The C60 comes with a bean hopper that holds several ounces of beans. To ensure that those beans are fresh and have all the flavor and aroma you want, Jura added a bean preservation cover to this hopper. That cover has an air-tight seal to keep odors out and to keep your beans fresher and ready for brewing. Select the temperature that you want your coffee to cup out of the machine at via the rotary dial. The C60 comes with two temperature settings that let you select between hotter and cooler coffee based on your preference. With its integrated Energy Save Mode (ESM), you can reduce the machine’s risk of overheating and cut down on electric bills. This mode forces the machine to switch into standby mode after just two minutes of no one using it. If it goes longer without any activity, the C60 will completely shut down. Though it performs many of the same functions as a commercial machine, the C60 doesn’t require a dedicated water line like those machines do. It comes with a 64-ounce water reservoir that you can easily remove for filling from your tap. The water reservoir also pops out for rinsing and cleaning too. Do you need to make a larger cup of coffee to fill an oversize mug? With its volume setting, you have control over how much water and coffee it mixes and how much comes out. Fill even the largest of mugs to keep you going all day long. If not everyone in your home likes the same type of coffee that you buy, you’ll like knowing that you can use ground coffee with this machine. Its bypass door opens easily and lets you pour the ground coffee right inside. You can still access all settings and drink options for use with that coffee. The frother on the front produces light and airy milk foam for topping your cappuccino. That frothing attachment also delivers hot water. You can press a button to get hot water for making tea or another type of drink. While it comes with an automatic shut down feature, you can also use that feature as a timer. Change the amount of time that you want the machine to run before it turns off. This lets you know that your home is safe when you leave. Hard water features elements that can make your coffee taste metallic or dirty. The CLEARYL filter on the C60 makes it perfect for use in homes with hard water. That filter can remove all the impurities that make your coffee taste off or wrong. Hard water can also leave behind residue that builds up inside, which is why you’ll like the automatic descaling program setting that comes built into this machine. That setting descales and removes any left over residue. Other settings are suitable for cleaning and rinsing. Fast Changes: A great feature of the C60 is that it lets you make changes to its settings at the last minute. If you want to get a double shot, change the strength or adjust the temperature of the water, you can make those changes seconds before it starts brewing. Low Price: If you think that an automatic coffee machine is outside of your budget, think again. Jura offers this model at a much more affordable price than you might expect. If you drink coffee daily, this one can help you save on the amount you spend every week. Fine Foam Technology: Anyone who loves adding milk foam to coffee will love the fine foam technology patented by Jura. This allows the machine to produce the richest foam for topping your coffee, but that foam still has the slightly sweet flavor of the milk. Specialty Recipes: The C60 comes with built-in recipes for making specialty drinks like an espresso or cappuccino. It also has different settings for a traditional cup of coffee. Change up your standard cup with the addition of more or less water, extra milk or lower or higher water temperature. Smaller Drip Tray: The smaller drip tray found on the C60 cannot accommodate larger cups. Even if you use two smaller cups, you may find that you need to brew each one independently to prevent spills and accidents because of that small space. Grinder Design: With its unique grinder design, this machine requires some manual help. You may need to stir the beans or force the beans down into the hopper for the machine to grind them. Wasted Beans: The machine may sometimes have a hard time registering the ground beans inside and ask that you add more beans before it brews. Automatic coffee machines are notorious for costing a lot of money, which is why Jura created a more affordable model that can work with more budgets. The C60 is part of its Impressa line of products that are suitable for use in any home. It comes with a conical grinder for more accurate grinding and an aroma preservation cover that locks in the flavor of those beans. While some experienced problems with the machine not registering the beans inside or not properly grinding those beans, we didn’t encounter any of those same problems when trying it. We like that it comes with settings for making espresso, cappuccino and other coffee drinks and that it lets you adjust the water temperature and coffee strength. 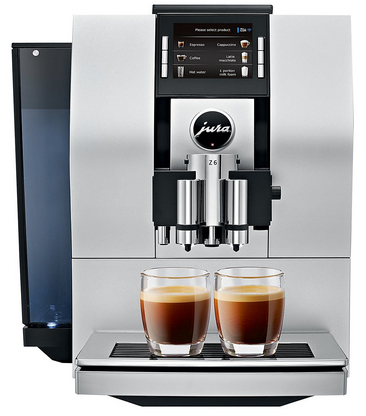 For those on a budget, the Jura Impressa C60 comes with all the features of a commercial machine at a better price. Though it costs more, the Jura Z6 is great for those who want a convenient and easy to use automatic coffee machine that makes all their favorite drinks. Its TFT display shows you some of the drinks that you can make, and you can simply press a button to make a coffee drink from one of those recipes. Many will like that the built-in burr grinder functions like a commercial grinder. You can adjust the coarseness of the grind via controls on the top near that grinder. Though the Z6 is a little larger, it features a completely modern design. 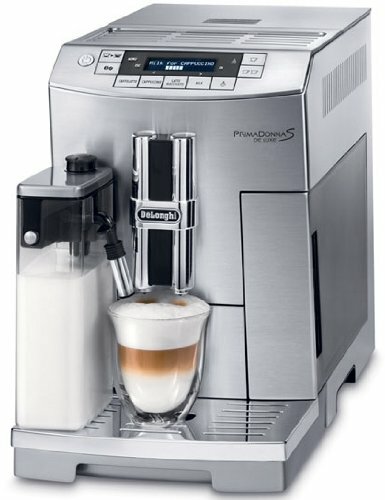 One of the best features of this DeLonghi model is its Lattecream system. This unique system lets you add rich coffee foam to your cup with just one button press. It also comes with a Direct-to-Brew feature that grinds your beans and sends those beans right to the brewing chamber to make coffee the moment you turn it on. Simple push buttons on the front let you change the amount you want to make and the number of cups you need. Those buttons also let you select a cafe late, cappuccino, latte macchiato or hot milk. 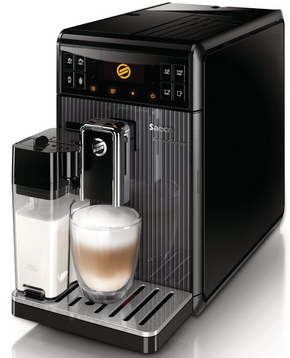 Become your own barista with this Philips Saeco Gran Barista Espresso Machine. It comes with many of the same features found on professional machines. One series of buttons lets you select from four drink options, and another series lets you select from four cup sizes. The included milk container helps you froth milk and enjoy warm milk in your coffee. Philips Saeco also added automatic cycles for cleaning and rinsing out the inside and ceramic grinders that grind your beans to the right texture without burning those beans.